The birth process, even under optimal controlled conditions, is a very demanding & traumatic event for the baby. As we know, the spine and skull protect our brain & nervous system, the master controller of our body. During labor, there is an extreme amount of stress placed on the spine of the newborn (and the mother as well!) The bones of the spine might move or misalign during this process, also known as subluxations. Furthermore, spinal cord and brain stem injuries can occur during the birth process, but frequently escape diagnosis. Gentle & specific chiropractic adjustments have been shown to help with these symptoms. 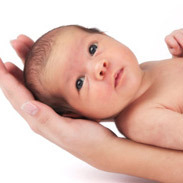 By removing any nerve interference, the baby’s nervous system can function & grow at optimal potential. Health ultimately begins at birth. Chiropractic care can correct any current problems & prevent future issues as well. Give your child the opportunity for optimal health & a healthy life by checking for subluxations! We recommend all babies be checked for subluxations. Dr. Senz is a certified pediatric chiropractic physician through ICPA. She has helped many families over the years, and would love to help yours! Contact our office at 440-639-1100 to schedule your family’s complimentary consultation.